Cult of the Dead Birds: Take my Makers... Please! The Ayn Rand disciples dream of a world where the "makers" quit making. They truly want all of the captains of industry, the "visionary" leaders to just stop, close up shop, and go away. They hope for a general strike of the Masters of the Universe. And to all of them, I say, please do. Strike, go away and quit bothering us. Hide in the Cayman Islands, or in a Swiss Bank vault. Disappear. The world will be a better place, trust me. Before I explain that statement, let me deconstruct the ideology of the "Taker/Maker" narrative. The myth of "Atlas Shrugged" is built on a number of fallacies and self affirming lies. It is a bedtime story told to convince the top 1% of their indispensability and as such is an exercise in little more than mental masturbation. Lets look at a few of these myths. The first myth is that the "takers" don't want to do anything to make their lives better; that their dream is to be taken care of cradle to grave. I would like to know where these people are, because I certainly haven't met very many of them. Most of the people I know who get some sort of assistance are desperate to get off of it. Whether it is unemployment, welfare, food stamps or any other form of the Dole, most Americans find it at minimum, embarrassing, if not outright humiliating. They take it because it is better than being on the streets, hungry and hopeless. It is a safety net, not a lazy-boy and most people feel that way. In fact, in an ironic side note, the primary recipients of government assistance who don't want to get off of it are senior citizens, the very group that breaks heavily for the party of the "Makers." They have a rude awakening if the Far Right ever gets into a position to fully execute their plan. But to return to my point, most people who have to live entirely on support wish they didn't have to. They have hopes and aspirational dreams, they want more for their children than they themselves have. With the exception of a small segment, these people are not happy to be "taking" anything. Parallel to this tale is the myth that anyone can succeed in America if they work hard enough. That may have been true once upon a time, although I doubt it was ever a ubiquitous as the American story would like to make it. Regardless of the past, it certainly isn't true in the present. The elites have been very successful in pulling the ladder of social mobility up behind them It is so extreme that even the Libertarian author Charles Murray wrote a whole book on the subject called Coming Apart. Even though he as well falls for many of thee "Maker/Taker" points, he forcefully makes the case that class mobility in this country is a thing of the past. Today, even with affirmative action and other policies designed to give everyone an equal chance at the American Dream, the actuality is that unless you have money and connections, you aren't going anywhere. One of the cases Murry presents in his book is that of Stuyvesant High School. This is one of the most prestigious public schools in the country, and the only way to get in is by getting a high score on the SHSAT. It doesn't matter who you know, it doesn't matter how much you make a year. The only thing that matters is the test. This seems to be the perfect example of the Meritocracy of America in action, the place where anyone can get the absolute best education in the country, regardless of social standing. And it did work that way for a couple of decades, and the school had one of the most racially and economically diverse populations in the country. Then the elite figured out how to fix the system so that only their children got this opportunity. They didn't change the admission process, that was beyond their control. Instead, the test preparation industry began offering prep classes for the SHSAT, very expensive and very good prep classes. As a result, the children of the elite, who could afford these classes, began to outperform the less advantaged students on the test. Now Stuyvesant High School is mostly white and rich. The poorer students have been mostly shut out of one of the most certain pathways to the upper class in the entire city. This isn't the only example of the ladder of opportunity being pulled up, but it is one of the best. 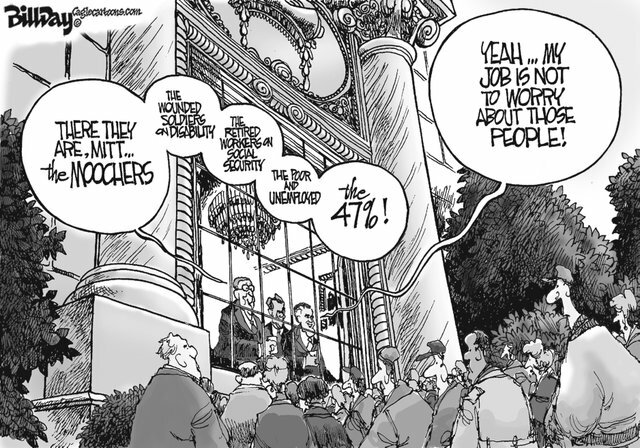 The point is, the "Makers" have made certain that the 47% that they consider "Takers" can't take positions in the upper class. The third myth is that getting necessities like health care, child care and other assistance of this type from the government destroys peoples ambitions. People who fall victim to this flight of the imagination actually believe that if you cannot afford health care, you shouldn't get any. They call it taking responsibility for your life. As if the general American could ever take personal responsibility for the costs of their health care as it stands. Until I got my new job, with it's shiny benefits package, my health insurance ran almost $900.00 per month. And that was just for me, I am not married and don't have any children that I know of. I was in a car accident a few years ago, and had to spend 4 hours in the emergency room. Even with health insurance, it cost me over $5,000.00 out of pocket (On a $20,000.00 bill) There are very few people in this country that could afford those kinds of costs. It is not being a leach to want the Affordable Care Act; what is being a leech is going to the hospital without any assistance from the government and walking on the bill because you can't pay it. Then everyone has to chip in through higher medical costs. Not only is government sponsored health care not going to destroy people's work ethic, it will likely actually improve it. With better health care, people will get sick less often, get treatment when they do get sick, and ultimately will be more productive in the workplace. Most people do not want to work only to pay their health care bills, but in today's society, that is want often happens. This government program makes people be able to contribute more, not less. So now that we have looked at just a few of the ways that the "Makers" have structurally enshrined their ideology into the system, let's look at my original position that the country would be far better off if Atlas did indeed Shrug and examine the primary myth of this group. They are not indispensable, they not actually needed and all of their bluster and their demands are actually just misdirection to make us think they are relevant. If the "Makers" went away, we would actually be better off because a new generation would step up to the plate, and they would have the opportunity to do so. The avenues that the elite have closed off would open and the stranglehold they have on the country would be released. First, there would be opportunities for everyone. Despite what the one percenters think, there are many ambitious and intelligent people out there. New entrepreneurs would emerge to take up the reigns of industry, maybe not trans global mega corps, but honestly, those are really not all that great to begin with. People will actually be industrious, when that industriousness actually gets them someplace, and it isn't just wasted effort. New local industry would have space to emerge and flourish without the suppressing nature of the current economic structure. Start-ups could really spring up on every corner, and those start ups would recapture the spirit of actual innovation and creativity that seems to be lacking in our highly polished stainless steel industrial machine. Money may be hard to come by, but ultimately the bankers would see new potentials for profit, and they would jump in with both feet. Even if they didn't, without the 1% fighting every bill in Congress, the government would free up research and development funds. Despite the lies from the Right, this would not be a bad thing, look at how we saved the auto industry for a model of this. The second advantage to the elite going on strike would be the opening of social opportunities. Perhaps we could return to the idealized meritocracy that the United States is always supposed to have been. Without legacy admissions, test prep classes, expensive country clubs, and the entirety of the Dressage Set, perhaps people from all standings would have access to the means to better themselves. This also shows up who is really the entitled class. Mitt Romney ran for President acting like he was entitled to the position by dint of his name, his wealth and his legacy. He couldn't believe that anyone would have the audacity of hope to not anoint him King and God. He acted like he could buy the Presidency just like he'd buy his wife another Cadillac. And he is not alone. The top percentile feels entitled to have their tax burden less than the middle and lower classes, they are entitled to better health care, better schools, and better opportunities. And the rest of us should just keep out mouths shut and let our social betters run it all. When people who have a vested interest in preserving their privileged position in society are not around, the doors will be flung open. For the first time an a couple of decades, children would again have a higher standard of living than their parents. The third advantage of losing the so called job creators would be in returning the political system to the hands of the actual people. Without the fire hose of special interests spraying down the throats of politicians, perhaps they could swallow some reforms that actually benefit the 99% of Americans who cant write a $5,000,000.00 check every other week. The last election already showed the power of the $20.00 donor, imagine if that money could actually be put to good use, instead of combating the handful of entitled rich old men who feel that it is their God given right to purchase whatever political office they set their eyes on. Without the "Makers" we might actually be able to make laws that benefit the entire country, open up opportunities for real growth, and actually enshrine the individual to give the liberty to pursue their happiness. The wealthy have built a mythology that makes them indispensable, and the source of all that is good in this country. but remember, these are the same people who convinced themselves that Mitt Romney would win by a landslide. So in the end, I ask the "Makers," please shrug. We'll even chip in and buy you an island.